A light and healthy quinoa salad tossed in a flavorful spice mix, and loaded with healthy wholesome ingredients like grilled chicken, salted pistahios, and shredded coconut! 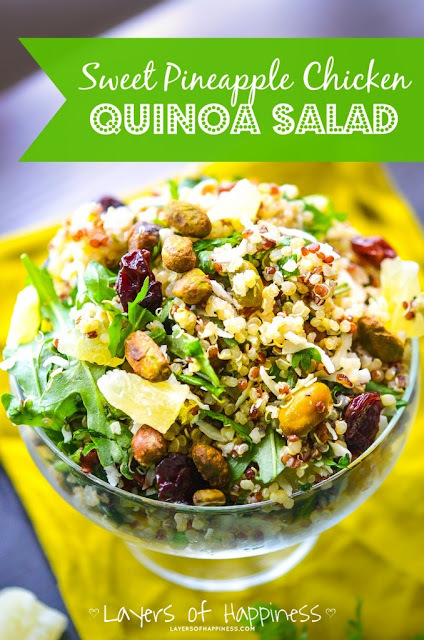 We have been on a clean eating kick around here… (something about summer and fresh, wholesome ingredients go hand in hand – things are more simple and fresh ingredients speak for themselves) and I must say, this quinoa salad has definitely been the most glorious and protein-rich of all the dishes we have made. Honestly, if all quinoa salads were like this, eating healthy would never be an issue.